Stand-alone or turnkey: you need a PC to program it then you can take it away. The controller can also be commanded from a supervisory computer using C, VB, Python, LabView, Matlab etc. and ROS. The multi-processor ST controller, K11R Mk5 provides all the power and intelligence to control a robot arm using a hierarchical architecture of CPU (central processing unit), DSP (digital signal processor) down to individual axis processors. The controller has an embedded programming language called Roboforth and is easily programmed using a PC. Once programmed the controller will run by itself even from power-on (turn-key). Extensive I/O capability makes it easy to control and interface with other equipment such as instruments or machines. There is no need for a separate PLC. Can also be used to control any stepper-driven robot including IGUS Robolink D and gantry up to 6 axes. 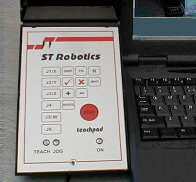 Although the majority of functions are invoked from the computer a simple teachpad is provided for fine positioning of the robot. The teachpad provides the means to select and move any joint or operate the gripper or any peripheral. Movement speed can be slowed right down for fine positioning of the robot. Alternatively in Cartesian mode the teach pad allows 'jogging' in any X Y or Z direction in increments from 25mm at a time down to 0.1mm for accurate positioning, or to change the angle of pitch yaw or roll in increments from 0.1 deg to 25 deg. A desired robot pose can then be learned by pressing the tick key. A programmable function key is also provided. The stop key is linked in to the safety circuit. 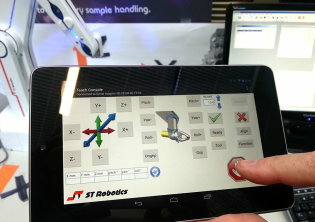 The optional 7-inch tablet teach console with Android software allows the user to position the robot wirelessly using a touch screen. The Android pad connects to the controller via bluetooth. Features include the ability to jog the robot in X Y Z in increments from 0.1 to 100mm, and the hand pitch yaw and roll in increments from 0.1 to 10deg. The current Cartesian position is constantly updated on screen. And of course you can use it for all the other usual Android apps: Chrome, GPS, email, etc. The K11R5 can also connect to, interface with and control all kinds of equipment such as pneumatics, feeders, plate stacks, conveyors, molding machines and synchronize all activities with the robot. There is an easily used input output register which can be expanded with a range of plug-in cards for analog or digital interfaces, serial, opto-isolated buffers and so on. This means you can easily arrange interlocks or control devices or take measurements while the robot is in motion. And you can add and control additional stepping motor devices such as indexing carousels, accurate bi-directional conveyers. Some clients use a K11 controller without a robot to control complex equipment and program it quickly and easily using Roboforth. You can also use it to control any machine with up to 6 stepping motors, with or without encoders. Additionally the controller has timers, interrupts and timer interrupts all programmable with the ease of Roboforth. The controller uses a fast pipelined CPU (Zilog Acclaim microcontroller) that can execute a Forth instruction in less than a micro-second. The CPU sends motion commands to a Texas DSP which in turn controls motion via intelligent drive modules, thus freeing the CPU for overall program control and I/O. High voltage MOS micro-stepping drives control the robot motors accurately and without resonance yet pack power and high speeds when required. Optical incremental encoders connect back to the DSP which sends this information back to the CPU on completion of each move. The CPU compares these counts with the counts it sent and halts motion in case of error. For example in the event of a collision robot motion is aborted and an error is announced (which is safer than most robot systems which continually try to get into position). Both the programming system and user's software are stored in high reliability (100,000 cycles) superflash memory but run in fast static RAM. A computer is needed to program the controller which can be removed after programming is complete. Connection is via serial RS232, USB, Bluetooth or TCP/IP. During programming data and procedure are saved both to disk and to controller Flash ROM. Once programmed the controller will run on its own without a computer. We can configure the IP converter for you. We just need details from you about your LAN IP address preferences. If you want to access the robot over the Internet you will need to arrange your own port forwarding. Even as configured there could be issues such as firewall settings that are beyond our control and you would need your IT department to help. Converters also available for various Fieldbus versions, Modbus, Profibus etc. There are 2 slots available for expansion cards. Up to 2 cards per controller. Axis drives are intelligent MOSFET chopper drives that energize the motors with PWM (pulse width modulated) constant current which recirculates at rest to prevent heating. Microprocessors automatically compensate for low and mid-range resonance. At low and medium speeds they vary phase current sinusoidally in a manner called micro-stepping. As speeds increase they 'morph' from micro-step to full step so that the motors maximum current rating is achieved. See the diagrams below - fig1 shows low speed sinusoidal control of position. You can see the PWM chopping. Fig2 shows the change to full step in progress. 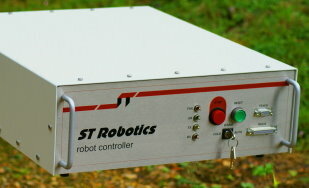 The K11R5 controls the robot using a software system written in FORTH called RoboForth II. Drivers and interfaces with the DSP and I/O are coded in fast, efficient, interrupt-free machine language but the user interface is high level, using easy to learn English language commands. A computer is needed to program the controller and this can be removed after programming or used as a supervisor running software which sends commands to the controller. To program the robot a Windows based GUI (graphical user interface) project management system, RobWin is run in the computer. The resulting program and data are downloaded into the controller which compiles them into a very small memory space, compact and highly efficient. See ROBOFORTH II for a full description. When using TCP/IP communication is by means of a virtual serial port. Each controller is supplied with class 2 E-stop, class 1 and optional class 0 stop circuits. Class 2 E-stop is programmable so that what happens on hitting stop can be strategically determined. The stop circuit is extendable round the work space and may be connected to light curtains etc. The controller is CE marked and for EMC complies with EN55022 class A and FCC part 15 sub-part B class A.